Preheat the oven to 200ºC (180ºC for fan assisted ovens), gas mark 6. Lightly brush the tortillas with some of the oil. Place on an ungreased baking sheet. Bake for 5 minutes or until the rims of the tortillas are lightly browned. Leave to cool. Meanwhile, heat the rest of the oil in a large non-stick frying pan over a medium heat. Add the beef and cook for 5-6 minutes, stirring frequently until browned all over. Stir in the pepper, taco seasoning and water and cook for a further 10 minutes, stirring occasionally. 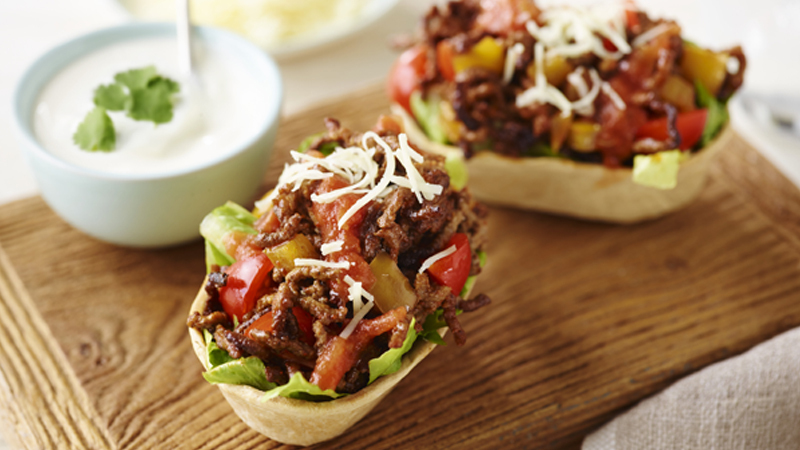 Divide the lettuce and tomatoes between the tortillas and top with the beef mixture, salsa and Cheddar or feta. Serve with soured cream and lime wedges. Try replacing the pepper with tinned sweetcorn or chopped mushrooms. Top with shredded red or green chill for a bit of extra spice!